When Ashley Nicole McClive and her husband rescued their dog Caramel she was in bad shape. 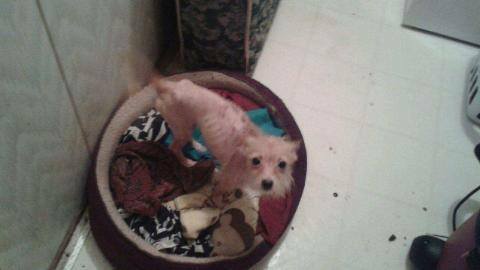 Locked away alone in a laundry room and barely fed for six years the little dog was skin and bones. Ashley took the little dog home and began to integrate her into the family’s pack of rescued Chihuahuas and one Australian Shepherd. Here is Caramel’s story in Ashley’s own words. Two months ago I rescued a dog named Caramel from her owner. Prior to my taking her, Caramel had been living in a laundry room for 6 years without any affection and nowhere to relieve herself. She lived in her own filth and never went outside. She was half starved with every bone in her body visible, her skin was bleeding and scabbing over due to the 50 + fleas I had to wash off her body and she was completely bald, except for a few patches of fur on her face and back caused by excessive scratching and malnutrition. After feeding her a healthy diet, giving her antibiotics for her skin and allowing her to run around outside with our other puppies she started to thrive!!! Her hair grew back, she gained nearly three pounds and her little feet, for the first time in 6 years, touched the soft, wet ground outside. She was so happy and became part of our family! Every night my husband and I gave her much needed affection and thanked God we were able to give her a good home. Last week, however, I woke up to find Caramel had had an accident in our bed. It wasn’t like her to not go on her puupy pad so I put her on the floor so she could finish and I noticed her dragging her two feet behind her. Horrified, I woke my husband up so he could see what she was doing. We knew we had to take her to the vet but we didn’t have much money to spend. Luckily our CareCredit agency gave us 500 more dollars on our credit card so we could find out what was wrong with her. The vet said she had “Intervertebral Disk (Ruptured Disk) Disease” and that it was causing the paralysis in her back legs. She gave us medication for Caramel and said that she needed to take if for two weeks, but that if it did not work our poor dog who had been so happy with us would need surgery. It’s been two weeks now and Caramel is still dragging herself along our floor. She isn’t able to go outside, or play with the other puppies. We’re forced to listen to her cry because she so badly wants to run again. She needs the surgery to heal her spinal and it costs $2000-2500 dollars and we just don’t have that much money. We’re hoping someone can help us raise enough money to get the surgery for our pup so that she may once again run around outside, go to the bathroom without having to wear diapers and most importantly so she can continue to thrive with us. Caramel is now on prednizone, and we are hopeful this will take down the swelling in her spinal chord so that she can walk again, but Ashley’s vet seems to have given up hope of helping the little dog and much to Ashley’s dismay has tried to convince her that the only “humane” thing to do is to put the little dog down and end her suffering. We who have been working in rescue for years know there is another way. We want to reach out to the animal rescue community to ask for your help. If we can raise the funds for Caramel’s operation we can ensure that the little dog has a full and happy life with Ashley and her husband, and their four month old son. Caramel was thriving with Ashley’s family, she was making friends with their other dogs and thoroughly enjoying a life where she wasn’t confined and alone. The following video clip shows Caramel and some of Ashley’s other dogs playing together, it is a short clip but it is easy to see that Caramel is thriving and enjoying the company of other dogs. Ashley and her husband tried everything in their power to help the little dog walk again, but now it is looking like surgery or a wheel chair might be the only solutions for Caramel. Ashley and her husband are desperate to help the little dog but they are a young family just starting out and money can be an issue. They never expected this and financially are unable to deal with the cost of the surgery, but they want Caramel to have a life and need the help of the global rescue community to help her. We are working to find wheels for Caramel and will be setting up a fund with her vet for anyone wishing to donate to the little dog’s surgery. Let’s start off the new year by giving a little dog a real chance at life! On Ashley and Caramel’s behalf I thank you in advance for any help you may be able to offer.